If you force a grasshopper into a jar and fasten the lid, the grasshopper eventually shortens its jump after hitting the lid enough times. 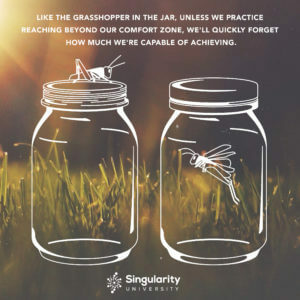 After a while, even if you take the lid off the jar, the grasshopper will stay put—it’s forgotten how high it can jump. We’re a lot like grasshoppers in this way. When we’re kids we believe we can be and achieve anything. But then, slowly, our big thinking starts disappearing, and before we know it, we’re playing it safe and setting goals we already know are achievable. The problem with playing it safe, though, is it never results in a breakthrough. This is why great leaders and organizations set moonshots—or wildly ambitious goals. These goals are at the heart of moonshot thinking, a unique and powerful approach to big thinking and problem solving. Moonshot thinking is how we can take the lid off our own ideas, and according to some of our favorite innovators, there’s a blueprint for how to shift your mindset. 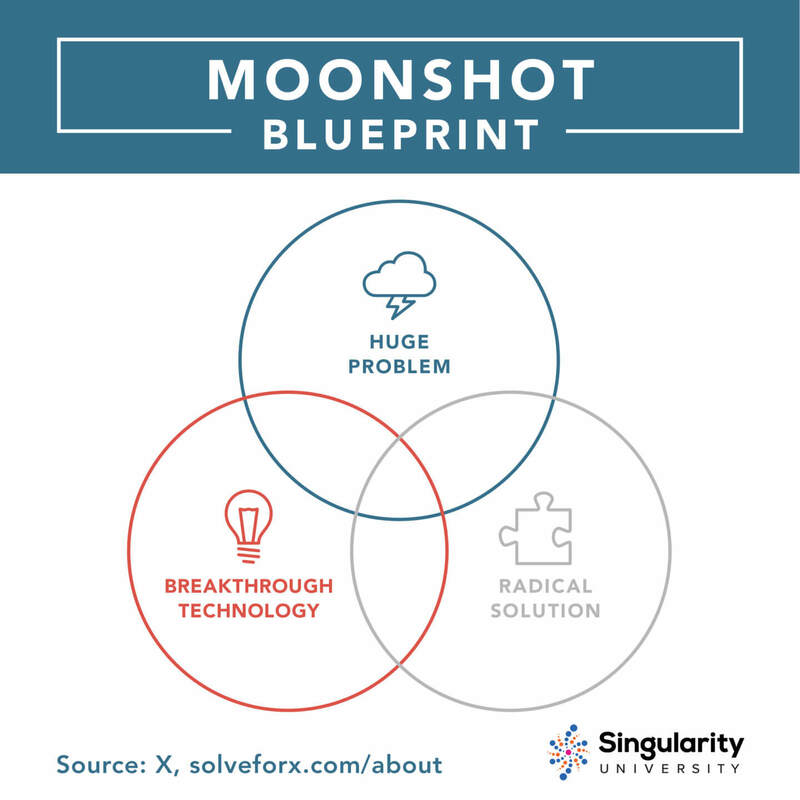 Maybe you’re thinking, “Moonshot thinking is just a Silicon Valley buzzword, like innovation.” But the term has deep roots. Let’s look back at its powerful origin. These words planted the seeds that ultimately changed the course of humanity. JFK’s original moonshot was heroic and grandiose—it took America to the freaking moon—but he didn’t set this goal (or moonshot) knowing how we’d achieve it or promising it would be easy. He said we were going to achieve something incredible, set the timeframe, and inspired action. The rest is history. This is the power of moonshot thinking in action. Now, over fifty years since Kennedy sent the country on this original moonshot, Google’s Astro Teller has made moonshot thinking his life purpose. Teller is Google’s “Captain of Moonshots” and the director of X (formerly Google X). X is a moonshot R&D factory where they test and launch projects that use breakthrough technologies to build solutions that can radically improve the world. Moonshot thinking is when you pick a huge problem, like climate change, and set out to create a radical solution to the problem. To make this happen you have to abandon the idea of creating a 10% improvement. Instead, the focus is a solution that will bring tenfold (or 10x) improvements, or solve it altogether. Focusing on 10x improvements (in areas like cost, speed, performance, design, etc.) triggers a series of behavioral changes that are key to making a moonshot a reality. Aiming for 10x causes a radical re-framing of the problem at hand. When teams approach a problem believing they can solve it, not just improve it, it uncaps individual and collective thinking. 10x thinking forces organizations to constantly prioritize innovative behavior, which is critical because innovation can’t just be whipped out when it’s convenient. Shooting for 10x frees teams to throw out the rulebook when needed. Moonshots often can’t be built atop the current assumptions, tools, and infrastructures that got you to the problem in the first place. Teller has outlined the three intersecting factors used at X to form a moonshot. You can follow this blueprint to form your own. 1. Huge Problem: Pick a massive problem that, if solved, would positively impact the lives of millions, even billions. 3. Breakthrough Technology: Search for breakthroughs and emerging technologies that exist today—like machine learning, 3D printing, and robotics—and leverage those technologies in your solution. This provides evidence that the solution (though wild-sounding today) may be possible in the future. All around us are breakthroughs that once started as moonshots. These breakthroughs often become so embedded in our lives that we fail to notice their presence! Think about the screen you’re reading this on, the refrigerator in your kitchen, the planes you fly on, the vaccines and medicines that keep you healthy. Once these were just moonshot ideas. Moonshot: Make humans a multiplanetary species. SpaceX’s Falcon Heavy will be the world’s most powerful functioning rocket when it lifts off later this year. Moonshot: Make an autonomously-driven vehicle. Google’s self-driving car prototype is electronically powered and equipped with the sensors and software to navigate and operate the car. Google self-driving cars have already driven 2 million miles on public roads. Moonshot: Make everything in space be made in space. Made In Space put the first 3D printer on the International Space Station in 2014. Now, they’re building Archinaut, an autonomous manufacturing platform that can build and assemble large-scale structures in orbit (picture antennas in space that are larger than a football stadium, providing internet to everyone on earth). Here are two expert tips from Teller on how to keep moonshots breathing in your organization (or kill them when the time comes). Think about it like this: you can’t expect teams to think big or act boldly if it’s clear your organization always kills big ideas and favors the teams who play it safe. Teams must feel a sense of freedom and safety to experiment; they need to know it’s safe to fail—because they’re going to. Having zero failures is often an indicator the thinking isn’t big enough. 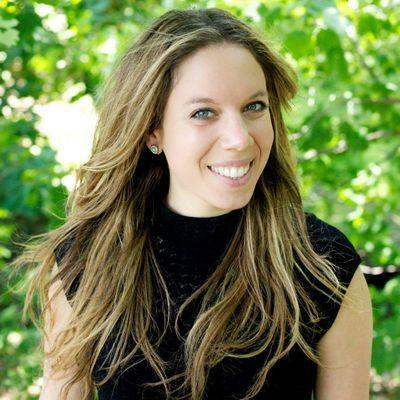 This is why Teller rewards teams when they fail. This culture must be embedded throughout an organization because big thinking and innovation are like muscles. If teams don’t exercise the muscles, they weaken. Teller talks about this as having “moonshots all the way down,” so that moonshot thinking even permeates how teams collaborate and form processes. At X, teams have a lot of room for experimentation and risk-taking, but they also have to put their ideas to the test early on. It’s a critical part of moonshot thinking. Failing becomes a lot more dangerous if you dump tons of time and money into an untested idea. Not gaining quick insights can also cause people to become overly attached to a specific idea or solution. Teams can test ideas by making lean (fast and cheap) prototypes up front. By repeatedly testing the prototype, drawing insights from the test, and then making iterations based on the insights (a process called rapid prototyping), the idea runs through rapid learning cycles with tight feedback loops. Gathering data points for an idea early on is also important because it’s how teams can quickly uncover problems and ensure that they’re moving in the right direction. Tight feedback loops and rapid learning also make it easier to know when an idea needs to be shut down. 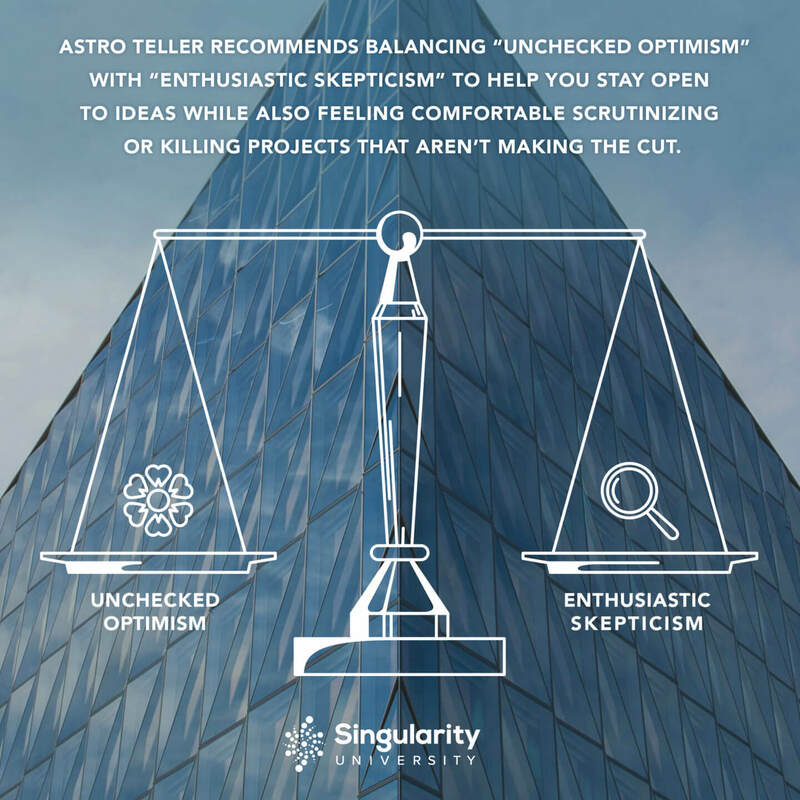 To do this, Teller recommends balancing “unchecked optimism” with “enthusiastic skepticism,” which helps you stay open to ideas while also feeling comfortable scrutinizing or killing projects that aren’t making the cut. Think back to JFK’s original moonshot. It all started with an audacious, seemingly impossible goal. Moonshot thinking challenges us to question what’s possible and to take on huge goals. In what ways are you capping your own thinking or your teams’? Are you taking on a big enough problem in the world? Breakthroughs in science, technology, and industry happen when we push into the unknown and explore distant frontiers. It’s one reason Star Trek’s famous motto, “Boldly go where no one has gone before,” speaks to the hearts and mind of millions. So boldly go, and dare to orient towards a big problem, because you never know what’s waiting to be discovered.